I've always wanted to sing In Dulci Jubilo with the verve this version has, but other than in the confines of my own kitchen, never have! Having learned the top part, and spent some time wondering quite what if anything was going to come out by the time the top A at the end was reached, ended up singing Alto. Hurrah. 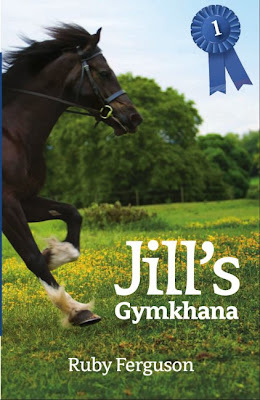 Jill's Gymkhana - it's out! Jill's Gymkhana: the full, unadulterated text, and ALL the Caney pics: for the first time in ooh, decades. It's £7.99, and can be bought from Fidra Books, the publisher. I really like the cover: Black Boy's black, for a start, and looks as if he might stand a chance in a show! A Stable for Jill and Two Ponies for Jill will be out in early 2010. Some fascinating research here on Jane Austen's first appearance in print. Dreamworks (Stephen Spielberg) have acquired the rights. Bearing in mind the difference between the book and the play, I'll be interested to see what new directions the film takes off in. who finds the self service checkouts springing up everywhere unbelievably irritating? Having decided that £40 was a bit much to spend on a Christmas tree, we retreated to B&Q who now have cheap Christmas trees (good) but now have these wretched self service things installed. The chap in the queue before us gave up, dumped his stuff, and left, and after the machine had been re-set, it was our go. It's the voice that gets me - all calmly reasonable, and so bloody bossy. Do this... do that.... Pay now... tolerant pause ... Pay now... further tolerant pause... Pay now.... by which time, the idiot human (me) at the other end is steaming, as all payment methods are at the right hand side, apart from the one I want, which is to the left, which Miss Bossy doesn't see fit to mention. Then being reminded "Don't forget your receipt" makes me want to scream "NO you bossy mare, I won't take it!"